A team of researchers from across Europe has found that human breeding practices, particularly during the Iron Age, are likely the cause of a lack of variability in paternally inherited DNA in modern horses. In their paper published on the open access site Science Advances, the group describes the DNA study they undertook to better understand the genetic history of the modern horse and what they found. 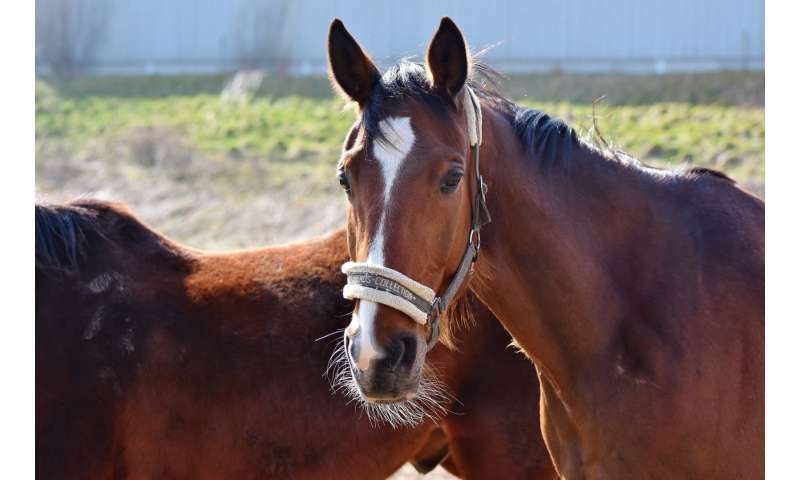 It has been known for some time that modern horses are genetically diverse, maternally speaking, but have a distinct lack of variability on the paternal side. The prevailing theory regarding this state of affairs is that during the time when horses were first being domesticated there were many more mares than stallions. In this new effort, the researchers suggest a different reason—they believe it is due to selective breeding, particularly during the Iron Age. The group came to this conclusion after conducting an extensive DNA analysis of both modern and ancient horses. The study consisted of gathering DNA samples from 350 horses covering the past 5,000 years and attempting to genotype them—in the end they were able to genotype just 86 of the samples, but that was enough to provide the team with a means for creating a timeline for four major haplotypes: Y-HT-1 through 4. Y-HT-1, the team notes, is dominant in modern horses. To create the timeline, the team divided the DNA samples into four time periods: earlier than 2,200 BC, between 2,200 BC and 900 BC, between 900 BC to 400 AD and from 400 AD till today. In looking at the haplotypes, the researchers found all but Y-HT-1 were heavily represented in the first period, but over time Y-HT-1 became increasingly prominent as the other three became less so. The researchers note that Y-HT-1 began its progression to dominance during the Bronze Age, a time during which humans were migrating across Eurasia. But the Iron Age was when Y-HT-1 really began to assert itself, a period during which the Roman Empire was reaching across Europe and changing ideas about how horses should be bred by focusing on males instead of females. This, the researchers claim, suggests that the lack of paternal diversity is very likely due to human breeding practices.